The Nigerian Professional Football League champions Plateau United were thought some footballing lessons when they were humiliated 4-0 by USM Alger in the play-off round, second leg clash at the Stade 5 Juillet on Tuesday. 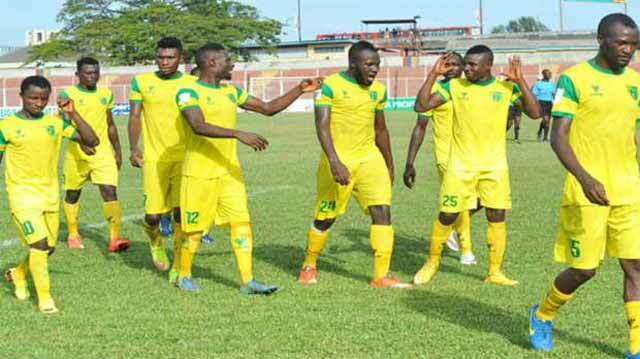 The heavy defeat means that Plateau United crashed out of the competition 5-2 on aggregate after winning the first leg 2-1 and hence failed to qualify for the group stages of the money-spinning competition. Another Nigerian club Akwa United also crashed out of the CAF Confederation Cup competition on the away goals rules despite thrashing visiting Al Hilal of Sudan 3-1 in the second leg of their play-off tie at the Godswill Akpabio Stadium, Uyo. The game ended 3-3 on aggregate and Akwa United crashed out of the competition on the away goals rule after the first leg ended 2-0 in Sudan. Enyimba FC of Aba managed to progress into the group stages of the CAF Confederation Cup after they were held to a 0-0 draw by 10-man Bidvest Wits of South Africa in the second leg of their CAF Champions League play-off tie at the UJ Esuene Stadium. Enyimba qualified on the away goals rule, after forcing the South African club to a 1-1 draw in the first leg encounter played in South Africa a fortnight ago. Enyimba is now the only Nigerian club left in the continent. The fourth Nigerian team MFM has also crashed out of the CAF Confederation Cup despite a face-saving 0-0 draw against Djoliba of Mali in the second leg of their play-off tie at the Modibo Keita Stadium. Djoliba qualified 1-0 on aggregate after they won the first leg 1-0 at the Agege Stadium and will now take part in the group stages of the competition.